Debussy was an important and innovative French composer whose music is usually associated with the French impressionist movement in painting. This is because many of his works have an affinity with nature, an impressionistic vagueness that he created using different scales and chords, and a manor of orchestration that was less formal. Debussy wrote songs for voice and piano, orchestral and piano works, chamber works, and a single opera. Debussy's music came at the time during which the last romantic era music was being written. He was not really a romantic composer; some writers have even gone so far as to rate Debussy as a 'classical' composer, but perhaps he is best classified as not only a composer aligned with the magic of the French impressionist movement in the visual arts, but also with the entire movement that occurred in French music during the last few decades of the century, a movement that produced some very important works. He not completely a romantic composer. For example, his music touches on romantism during the final bars of his orchestra work La Mer, however. 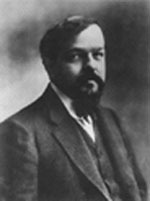 In his teen and twenty years, Debussy wrote a number of short piano pieces that have become his most popular compositions. These include the Arabesques of 1888-81, the R�verie of 1890, and the Suite Bergamasque of 1890 (including his most famous composition, Claire de lune). The song Beau Soir that Debussy wrote when he was only 18 is perhaps his most famous song! Debussy's early music, composed in a more traditional musical language, is extraordinarily beautiful and evokes a particular magic that only Debussy seemed to have. Also during his teen years, Debussy was exposed to the music of Richard Wagner and in 1888 and 1889, following the tradition of many French musicians, made pilgrimages to Wagner's theater in Bayreuth to hear Wagner's music. (see this article also) As were most of the composers in France at that time, Debussy was significantly inspired by the revolutionary music of Wagner. But another French composer's music made a very strong impression. His name was Erik Satie. Eric Satie was was at that time an unknown composer with virtually no academic training, and a friend of Debussy. Satie's Sarabandes of 1887 contained music of a shocking originality. This music had unresolved major and minor seventh and dominant ninth chords, one following another in succession. Here for the first time is the harmonic language that will become associated with Debussy, Ravel, and later, American jazz after the innovations of Charlie Parker and Art Tatum. Satie's Prelude de la porte h�ro�que du ciel of 1894 was a revelation to Debussy. In this piece, Satie moved from one triad to another outside the requirements of traditional harmonic chordal resolution. These features, along with the music and orchestration of Wagner, were the inspiration for Debussy's own musical language. The first hint of this new harmonic language appeared around 1890, most notably in the song Recueillement from the Cinq po�me de Baudelaire, a set of songs strongly influenced by both composer Wagner and Satie. Debussy's string Quartet of 1893 began where Cesar Franck's quartet of 1889 ended. The masterworks of Debussy's second period are his opera Pell�as et M�lisande. composed between 1983 and 1902, and Pr�lude � l'apr�s-midi d'un faune, written between 1892 and 1894. The are perhaps his greatest works. About Pell�as et M�lisande, Corinne Heline writes "The music is so tenuous, so mystically beautiful, that a listener is often caught up in the ecstasy of some strange exhilaration and at other times is brought to the very verge of tears." In this score Debussy was able to capture the essence of the invisible world of nature. I attended a performance of the San Francisco opera, and I remember the stage being bathed in green light, the color of nature. It was perfect. I will never forget this magic experience of Debussy's opera. In his book Debussy and Wagner, Robin Holloway demonstrates exactly how the music of Pelleas was inspired by the score of Wagner's Parsifal, which is perhaps the greatest work of spiritual music ever composed. During the third period Debussy embarked on a new journey, creating a music with new harmonic and melodic language, employing new scales and harmonies. Abandoning many of the tenets of traditional harmony, he began using the ninth and thirteenth chords that he had discovered in Satie's Saranades, and abandoned tradition resolutions and rules such as the avoidance of parallel fifths. This transformation begins with around 1903 with such works as La Mer (begun in that year) and Estampes. The preludes Book Two, completed in 1912, are a monument to a completely different harmonic language than that found in Book One, completed in 1910. Debussy was burdened with having to work on projects he detested in order to make money. About Le martyre de St. S�bastien, he wrote to his wife: "This proposal means nothing to me of any value." However she and several friends persuaded him to undertake the project, which he would have never considered except for financial reasons. He turned to his friend and collaborator Andre Caplet to orchestrate the work and, we believe, to help him write it. Thus, we have a work of Debussy that is of inferior quality. Another work that he hated was the Rapsodie for saxophone. Jeux, of 1913, was also written for financial reasons. Caplet's orchestration of La Boite a Joujoux of 1913 is obviously based Stravinky's Petroushka, which was a big hit in Paris in 1911 and which Debussy had fallen in love with. In the end, Debussy complained that creativity had abandoned him. He died of cancer in 1918. This beauch composer (Cesar Franck wrote the first). If you are looking for a CD, find one paired with either Ravel's or Franck's quartet. This beautiful suite contains the lovely Claire du Lune (Moonlight).